In this tutorial, you will use the Desmos API to create an app that generates random straight lines on a set of axes. In this tutorial, you will use the Desmos API to create an app that generates random straight lines on a set of axes. Clicking the Next button generates a new line. The finished app is shown in the figure below and you can see it in action on JS Bin. The app also shows two points on the line. Clicking the points displays their coordinates. In this first version of the app, the x values of the two points will always be 0 and 1. That makes it easy to see the y-intercept and to calculate the gradient of the line. 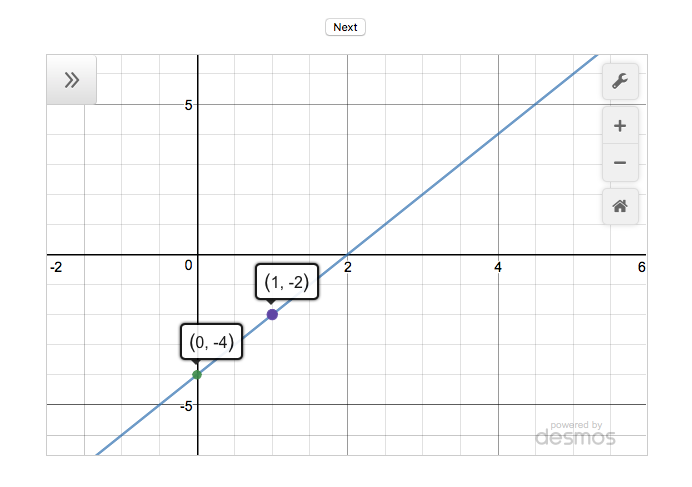 Once you import the Desmos code, you can create instances of the Calculator object and use it to display points and graphs. But where does your calculator appear? You'll need a container for that. With the Desmos code imported and an element waiting to show the calculator, you can create your first calculator and show a graph and points. The calculator has an expressions list on the left and a grid for graphs on the right. Both are empty. You can type expressions for points and graphs into the list on the left and they will be displayed on the grid. First, you get a reference to the div you included in the HTML. You assign the reference to the elt variable. 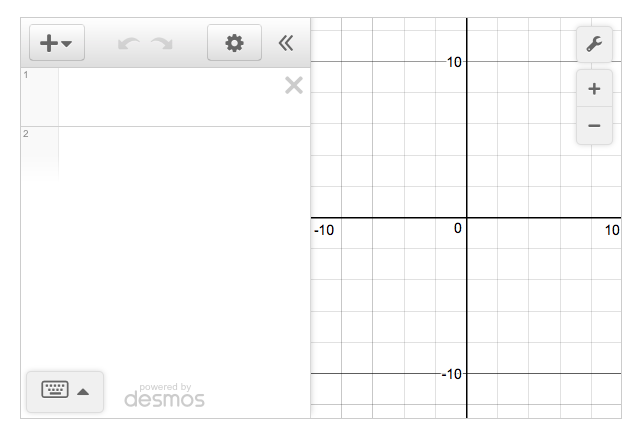 Then you create a new Desmos calculator. You pass it the reference to the div so it knows where to display the calculator. You assign the new calculator to the calculator variable so you can use the calculator later in your code. Creating a calculator with two lines of code is impressive! But, you want to be able to add points and graphs via code. To add expressions to the expressions list, call the calculator's setExpression method. Listing 5 includes the full code for generating lines at random. I discuss selected parts of the code in more detail after the listing. This code would be in its own file and you would import it it into your HTML page using a script tag placed after the Desmos API script. Access the x and y properties using dot notation. The gradient of a straight line is given by the 'change in y' divided by the 'change in x'. The getGradient function uses the array of points to calculate and return the gradient of the line through the two points. You can write the equation for all of your generated lines in the form y = mx + c, where m is the gradient of the line and c is the y-intercept, the y value of the point on the y-axis that the line passes through. The getGradient function calculates the gradient and the y-intercept is just points.y , where points is the array holding both points on the line. The lineString function builds the equation of the line, using the gradient and y-intercept. 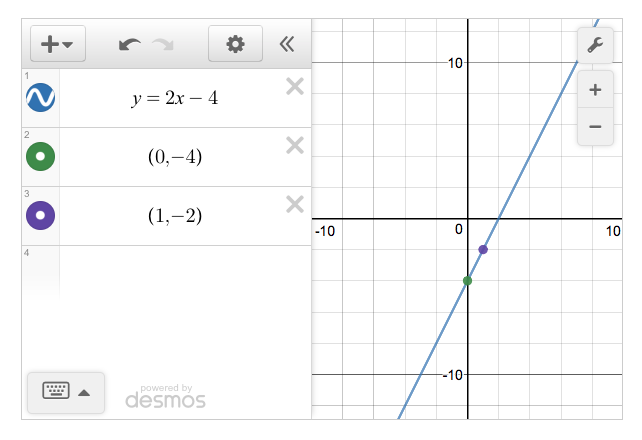 Once you have the equation of the line (and strings for the two points), you update the Desmos calculator, setting three expressions: one for each point and one for the line. Every time you call showLine , it uses the same id values for the three expressions; any previous expressions using those id values will be updated. That's exactly what you want. Every time the Next button is clicked, the expressions are updated and the calculator shows a new graph. Congratulations! You have a working straight line generator that uses the Desmos API. In part 2, you add the ability to create a set of random straight lines and navigate between them. You also see how to better customise each Desmos calculator you create. Published at DZone with permission of John Larsen . See the original article here.